Rear facing is totally amazing for safety… totally not amazing for a nosy toddler who needs to know everything, see everything, and talk about everything. Since safety obviously wins, I had to find some ways to keep Layla calm and occupied during car rides. I tried books, they were either ripped or thrown dangerously close to Olivia. I tried stuffed animals and toys, but if she dropped one she screamed bloody murder to get it back, which was not a possibility while I was driving. I tried kids cd’s, which sort of worked, but I may end up in a mental institution if I have to keep listening to Elmo sing songs with her name. I needed a way to make her feel included, and in turn not whine and scream every time we drove more than 5 minutes. Since she is good with her colors I focused on stop lights. Making something resembling an actual traffic light would’ve been cute (and maybe we will try it at a later date) but remember if you’re in the car you need the activity to be as easy as possible to avoid frustration. 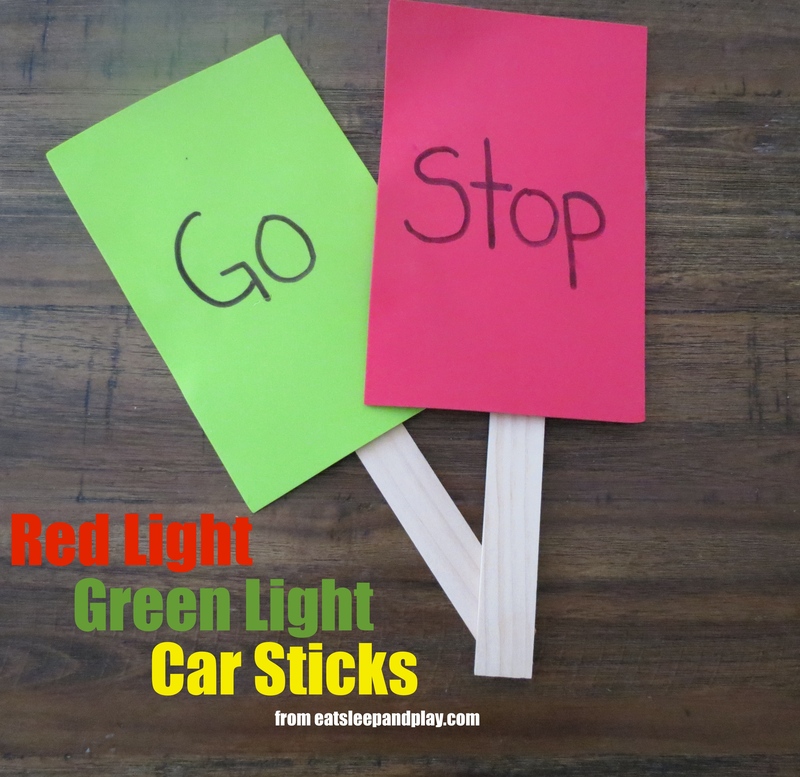 We went with a simple red light stick which says “stop” and a green light stick that says “go”. Prior to using our sticks in the car we looked at pictures of traffic light, talked about what we do on the road when you see one, and how these lights help cars to drive safely. The book “Go Dogs Go” was super helpful in reinforcing these ideas. 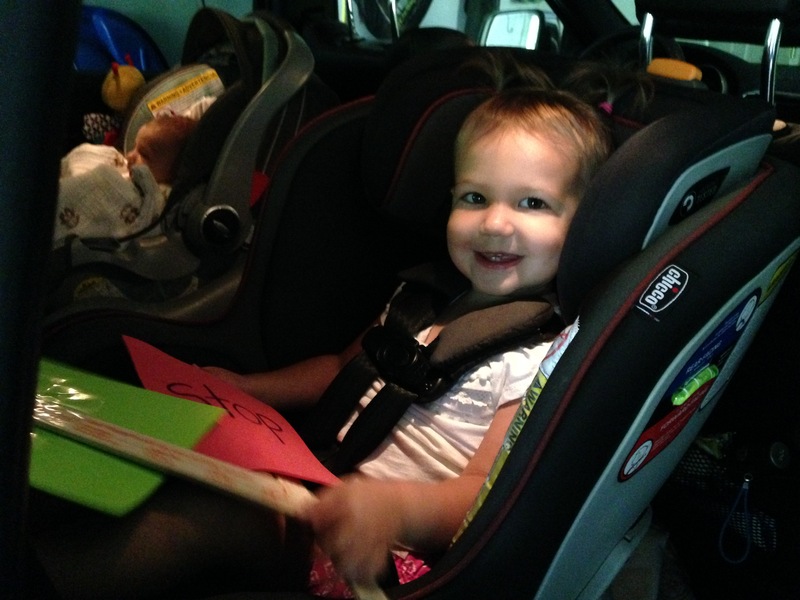 I allow Layla to keep the traffic light sticks in her seat during car rides and for the first few minutes of the ride I will call out to her what kind of light we’re at, and she can hold up the appropriate stick. After a few car rides doing this she caught on, and looks for the lights herself. She yells out “green light go” or “red light stop”. This has also helped me for those times she gets very impatient when she can feel that the car is stopped. I was pretty impressed with how quickly she picked this up (and pretty surprised at how much she can actually see back there). As kids get older and more advanced you could add in various other road signs (add the yellow light, stop signs, school zones, etc) for them to identify! Trim your foam or paper so that it is not too large- you can make them any shape you want! I used a rectangular foam sheet, and did not need to trim it down at all. Label the red foam sheet with the word “stop”, and the green foam sheet with the word “go”. Use heavy duty tape (or a hot glue gun) to attach the foam sheets to the stick. Place them in the back seat of your car so that children have access to them while driving! I’m on the hunt for a way to organize all of our car necessities and activities and would love to hear your suggestions! Contact me with your ideas and be featured on the blog!